There are different methods to clean jewelry; however, the most effective method to clean jewelry is to clean it just like jewelers do with an ultrasonic jewelry cleaner. Ultrasonic cleaners are easy to use and provide the most powerful, efficient, and sustainable method to keep jewelry looking showcase brilliant. You can take your jewelry to the jewelry store to have them ultrasonically clean it for you or you can purchase a professional style ultrasonic cleaner for a reasonable price to use at home. Tip: you can clean more than jewelry in an ultrasonic cleaner. Ultrasonic technology has been proven over many years to be the most efficient method for cleaning jewelry (and many other applications,) but most users are unaware of just how powerful ultrasonic cavitation can be. Cavitation describes the process of bubble formation and violent collapse, or implosion in a liquid medium (water.) The forces created at the bubble implosion are responsible for the action that ultrasonic cleaning is known for — these forces include the water jet turbulences created and what is referred to as the water hammer that reaches pressures up to 60,000 psi. This acoustic technology, the phenomenon of cavitation is what can break down cellular structures, emulsify and homogenize fluids for better stability, remove bioburden and debris — in other words, cavitation gets the crud off your jewelry so that it sparkles like it was intended. Make sure that you only clean your precious jewelry. Soft semi-precious stones can be damaged. Inspect your jewelry for loose stones. If you have loose stones they can be dislodged which could be a good thing as it’s better to lose a stone inside the ultrasonic tank than the shopping mall or gym. Watch casings should not be immersed in the ultrasonic tank — even waterproof watches should not be immersed. Most jewelry cleaners today come with a bridge accessory to lay watches over that keeps the case out of the water. Otherwise, hold the case above the bath and let the bracelet drape inside. Expensive, toxic cleaning solutions are not necessary. The real cleaning is done by the mechanical forces of cavitation as described — the solutions work to gather the removed debris and make rinsing easy. We recommend our Eco4 Certified Green All-Purpose Cleaning Solution and only a small amount added to water — adding too much cleaning solution will only make your ultrasonic cleaner less productive. Prepare the ultrasonic cleaner with tap water and a small amount of cleaning solution. Inspect the jewelry for any loose stones. 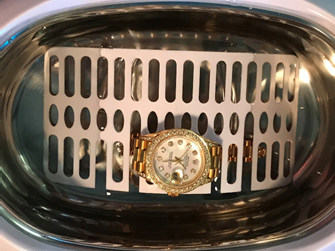 Immerse the jewelry into the ultrasonic cleaner using an accessory item like a basket or watch bridge. Do not put jewelry directly into the machine so that it lays on the bottom of the ultrasonic tank. Set the ultrasonic cleaner timer, a 5-minute cleaning cycle is usually sufficient — press start. When the ultrasonic cleaning cycle is complete remove the jewelry and rinse. Dry the jewelry with a soft cloth or blow drier. Your jewelry is ready to wear, brilliant and beautiful as all the oils that were attracting dirt have been removed by the powerful ultrasonic cavitation.